South decoration materials market in Guangzhou in Guangzhou City, the largest distribution center south of decorative materials business road adjacent to the north and south fruit market, and Guangdong, Guangzhou, Guangzhou, South China and other major markets even as a decoration materials, decorative materials go into the city, to take the opportunities . Decorative material market north and south through the wide clear road North, South Railway Station, Guangzhou-Foshan highway west, east, Zhongshan eight radiation center. South decoration materials market, covering about 10,000 square meters, equipped with more than one hundred of shops, divided into A, B, C areas. Separate meter for each shop, shop shutter configuration. Adorned with complete automatic fire sprinkler and fire alarm systems and alarm monitoring system, there is a one-way road and car parking, easy access to parking and loading and unloading cargo. Market to provide security services, sanitation cleaning services; floor not operating inflammable and explosive materials, suitable for business franchise architectural ceramics, sanitary ware, stainless steel decorative materials, etc., really giving benefits to businesses. Decorative material market north and south by the Guangzhou City Industry and Commerce Administration registration certificate issued by the market, complete formalities. 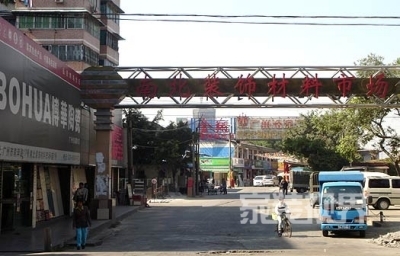 Market the property by the planning department approved the construction of permanent buildings, is owned property, non-temporary nature of the simple construction and leasing of properties comparable with long-term operation assurance. The most affordable rental market stalls, management practices. Market manager - property leasing office will further improve the management, providing customers with quality service, and entering the business customers to create prosperity.